Sometimes it's a road between two South African shantytowns that the eponymous aging lovers of Boesman and Lena hobble down together, sometimes it's the Road of Life. When it's the latter, this screen version of the Athol Fugard play slides into Beckettland. 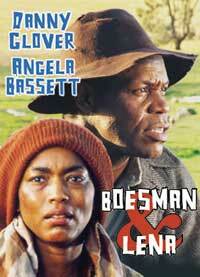 Boesman (Danny Glover) and Lena (Angela Bassett) become like Waiting for Godot's tramps, Vladimir and Estragon, forgetting where they've been that morning or where they'll end up at night, amnesiac about everything except that hardship seems to return and return. Instead of God, there's déjà vu, in this bleak, minimal landscape lorded over by a branchless tree. Othertimes, Boesman and Lena is a drama of social consciousness and not of metaphysics, grounded in the concrete horrors of apartheid, with these indigent blacks as South African racist victims. Filmmaker John Berry opens up the one-set Fugard play to flashbacks, even a sedate, happy one, in which the protagonists (the movie was shot around Cape Town)are youthful and sensual and Lena spends her day dancing away in the sun. But today's day is another story: it begins with the now-feeble duo kicked out of a town, their squatter dwelling knocked over by vigilante white-man bulldozers. Finally, Boesman and Lena is about moral issues. They've been booted from the city because of a bunch of shattered empty bottles, no longer redeemable by the white employers. In front of these whites, Boesman blamed Lena for the deed and beat her up. Later in the day, Lena presses Boesman to fess up: he was the bottle-breaker! I'm not sure that Fugard's sometimes histrionic play should have been brought to screen, but Glover and Bassett give a valiant try to make the story live. They're wonderful actors, and only when we see them young in flashback do we realize how much their decrepitude is a performance. And kudos to American expatriate director John Berry, a blacklist victim, whose last work (he died at the end of filming) concluded a half-century career of stirring political consciousness, starting with John Garfield's He Ran All the Way (1951).